This post will guide you how to use Excel RIGHT function with syntax and examples in Microsoft excel. The Excel RIGHT function returns a substring (a specified number of the characters) from a text string, starting from the rightmost character. The RIGHT function is a build-in function in Microsoft Excel and it is categorized as a Text Function. The RIGHT function is available in Excel 2016, Excel 2013, Excel 2010, Excel 2007, Excel 2003, Excel XP, Excel 2000, Excel 2011 for Mac. Text -This is a required argument. The text string that you want to extract from. num_chars-This is an optional argument. It will specify the number of characters that you want to extract from Text string. Note: The Num_chars value must be greater than or equal to zero. If Num_chars is greather that the length of text string, it will return all of text string. If Num_chars value is omitted, it is set to be 1 by default. 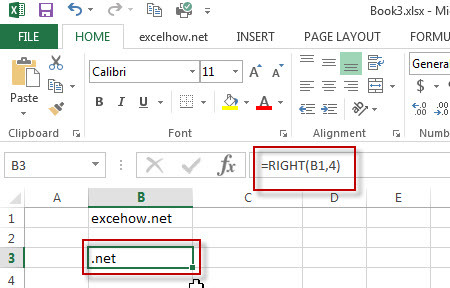 The below examples will show you how to use Excel RIGHT Text function to extract the rightmost substring from a text string. #1 To extract the rightmost 4 characters in the B1 cell, just using formula: =RIGHT(B1,4). If you want to extract the first n characters of a sting in a cell in Excel, you can use the LEFT function to create a formula to achieve it. ……..